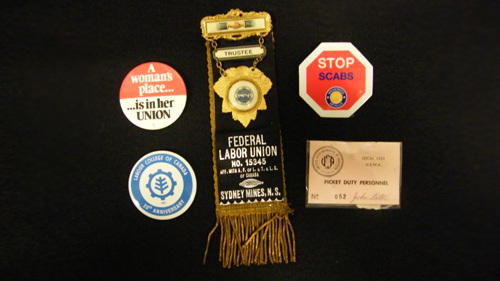 It is a challenge to collect artifacts to tell the story of unionized labour. So much interesting material is not considered to be “artifacts” and gets thrown out. Whether protesting or claiming pride in union membership, pins have long been an inexpensive and effect way to show solidarity. The little booklets represent hours of negotiating between business and labour. The Museum has collected a variety of material relating to union activity, especially in the Pictou County Coal Field. We have records of union meetings, insurance plans, even a couple of songs.